Albion suffered humiliation as they succumbed to their heaviest ever defeat at the Amex. In fact the Albion were on top until Shane Duffy, who was playing far further forward than he should have been, played an ambitious ball that was easily intercepted by former Albion player Steve Cook, who sent Bournemouth forward. This led to Dan Gosling casually planting a shot past Maty Ryan to give the Cherries a 1-0 lead. And that was the score at half time. But soon after the restart Chris Mepham and Florin Andone clashed and both received a yellow card. Many Albion fans thought that Mepham deserved a more stringent punishment. On 55 minutes Bournemouth cut the through the Albion midfield and Ryan Fraser put the Cherries 2-0 up with a great shot into the top corner. Glenn Murray replaced Andone. Not long after, the 35-year-old striker had a superb chance but seemed static and was unable to convert it. As the ball went loose, Anthony Knockaert lost his head, scythed down Mepham and was shown a straight red card. Five minutes later Bournemouth again scythed through Albion’s defence and David Brooks lifted the ball over Ryan to make it 3-0. The agony wasn’t over. Callum Wilson put Bournemouth 4-0 up with a full eight minutes left. By this time Albion were in damage and injury limitation mode as the fans streamed out of the Amex. The Seagulls’ only consolation was that Cardiff City were two down at Burnley and by all accounts had a clear penalty turned down. Junior Stanislas completed the rout two minutes into added time and a minute or so after Jurgen Locadia had Albion’s first and only shot on target. Bournemouth’s keeper Artur Boruc should have, by rights, been made to warm down with Bournemouth’s non-playing substitutes, so inactive was he during the afternoon. On the day when Albion celebrated the life of the club’s third all-time highest goal scorer Kit Napier it was a worry that Knockaert scored Albion’s last goal at Crystal Palace back on Saturday 16 March. 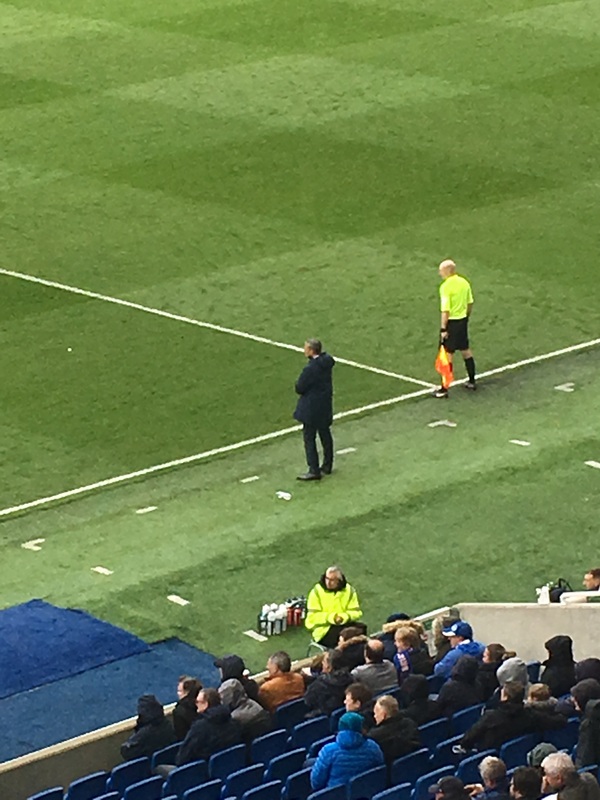 Empty seats as a dejected-looking Chris Hughton looks on. A win against Cardiff at the Amex on Tuesday night (16 April) is now crucial and the Seagulls could virtually confirm survival in the Premier League almost exactly two years to the day when they won promotion. These players totally let the club down today – the worst bha result since the 1983 fa cup final replay – they should be ashamed of themselves and hand back this months wages – you can’t blame this on the manager – players like bissouma, locadia, andone, propper, duffy, montoya, knockaert, ryan, bernardo, stephens etc promising much but offering nothing, in particular bissouma – have seen him trip over his own shoelaces about 5 times too much against bournemouth alone – useless – andone and locadia terrible in the air – bernardo like a prancing primadonna with a chip on his shoulder about racism – i don’t think there is a big problem with racists or racism in brighton (oe Hove) – just put the ball in the back of the net – who buys these players ? It is about time that The Albion introduced a bonus wage scheme! Only pay the players, trainers and managers a very basic living wage and then only increase their income in accordance with the match results.